Nice Buns Doh – Where Is My Teaspoon? Buns glorious buns! Sticky and soft, these are the perfect treat for a lazy morning or to serve if you have someone coming over for a quick coffee. Living in Cambridge means everyone is mad about a Chelsea Bun from Fitzbillies, where they have been making them for over 100 years. Someone once told me that they ship their buns all around the world. Next time I’m in Fitzbillies I’ll take some photos and share them so you can see what it’s like. There is almost always a queue to get in though like everywhere in Cambridge which drives me mad. I love being able to just walk in and take a seat but it is always just so busy around here. The cafe itself is really lovely though and makes good jam, especially with a freshly baked Croissant. 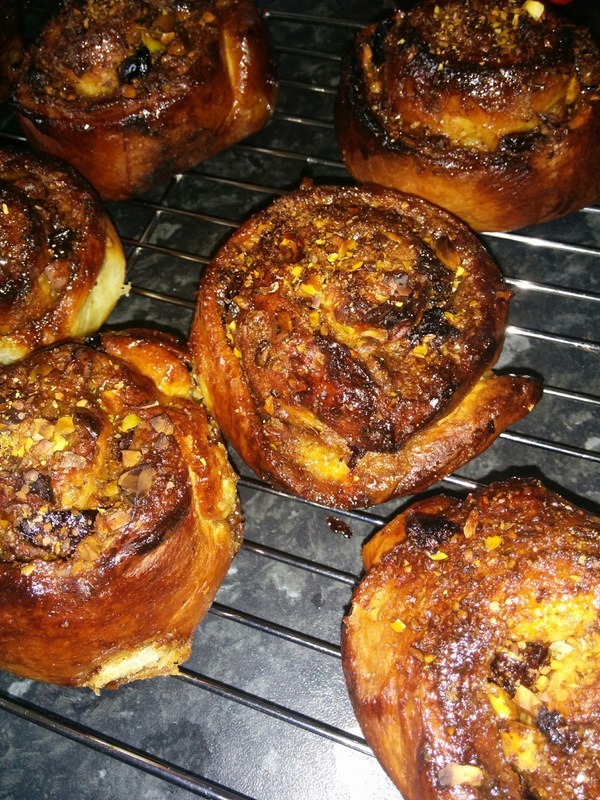 My buns aren’t quite Chelsea buns as I have used different flavours but the great thing about this recipe is that you can add whatever you like to it. I think Cherry and Roasted Nuts go really well together but I have also made Chocolate Orange, Chocolate and Pecan, Date and Walnut, Orange and Almond..the list goes on! Fruit and Nut is definitely my favourite combination though as I like the crunch. Otherwise, it is just a mouthful of dough. The buns do have a sugar glaze on top. Try not to skip this step as it does make them look so much nicer and does add to the taste. Another top tip is to use an electric weighing scales – so handy for weighing dried yeast. This is a basic bun dough to which I add spices. I only add about 1/2 a teaspoon of each spice to my dough recipe. I like to do this because I just think it adds an extra element to the otherwise plain dough. I always heat the milk gently to start. I know some people will say you don’t need to do this or that it is a cheat but for me, this always gives consistent results. You don’t want the milk to be hot – just warm. Take off the heat and add the yeast. Allow to sit for a couple of minutes. Put the butter, sugar, egg into the bowl and add your milk. Thrown in your flour, spices and salt now. I don’t own a mixer so just use my hands to bring this together into a dough. I make a claw shape to gather it and then begin to lightly knead in the bowl until it’s fully together. Tip out onto a clean surface and knead until you have a smooth dough. Try not to add more flour, the less you add the better! When the dough is smooth (about 10 minutes), pop it back into the bowl and dust with flour. I cover mine with a clean tea towel and leave by a radiator to prove. It needs to at least double in size but normally takes between 2-3 hours. While your dough is proving, get started on your fillings. You need to make sure all the nuts are flat on a baking tray and have space. The nuts do become very hot though so be careful not to touch straight after they come out of the oven. I like to roast them whole and then chop them by hand. 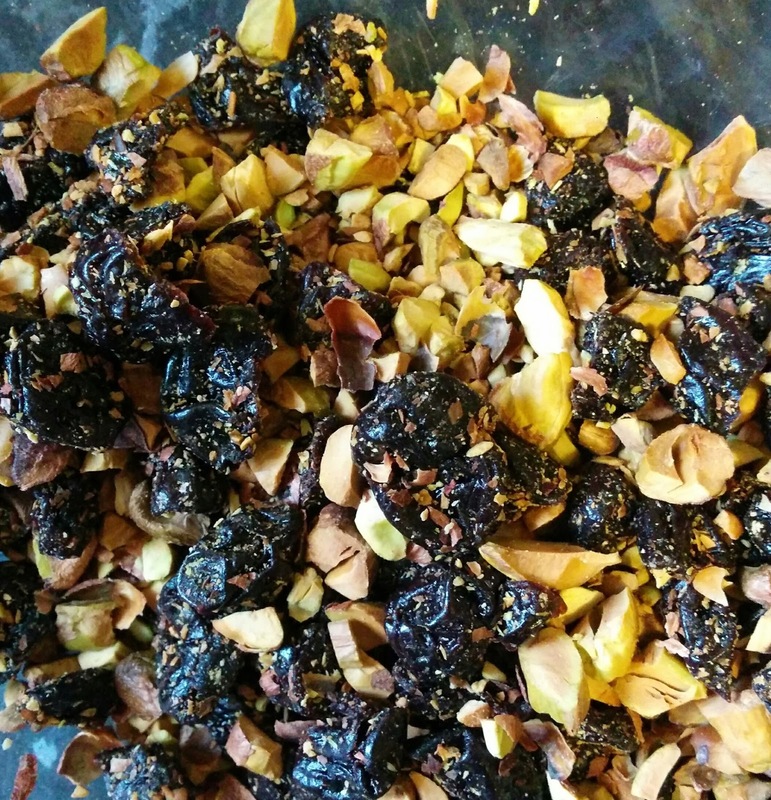 Once you’re happy with your nuts, just roughly chop your dried fruit or just weigh them out if already in small pieces. Sometimes, I soak my fruit in alcohol first. If happy with your dough, you’re ready to begin constructing the buns. Pick your baking tray. Brush the tray with melted butter and cover with baking paper. 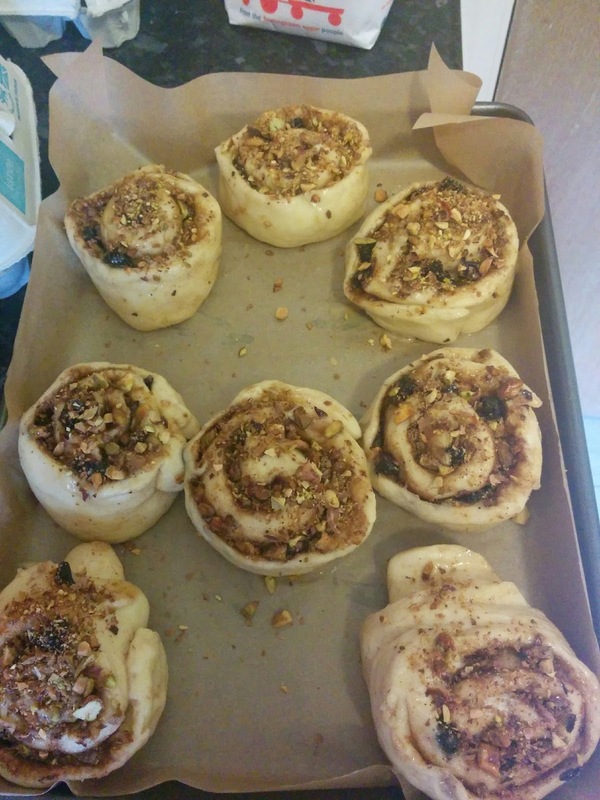 These buns are basically a cut Swiss Roll so this is not a new skill if you follow the blog. Roll out your dough (or just stretch it) into a rectangular shape. Spread some soft butter across all the dough as if you were buttering bread. Sprinkle the brown sugar over all of the dough and top with the fruit and nuts. I like to add another dusting of spices here to push the flavour even further. Roll up the dough as you would for a Swiss Roll and push both ends together so it is a nice, chubby log. Cut into 8 pieces. Place your buns flat on the baking tray and cover, leaving to rise again for about 30 minutes. Preheat the oven to 200 degrees while you wait. When they have doubled again, wash them with some egg wash and pop into the oven for 40 minutes. Now, buns can break your heart and burn. There is loose sugar, nuts and egg wash involved which can be temperamental on their own never mind all together! I watch them like a hawk, making sure to turn the tray around and cover with a tinfoil hat if needed! While they bake, make a simple sugar syrup but adding 100ml of water to 100g of white sugar. Bring to the boil making sure all sugar is dissolved and then take off the heat. Once the buns are cooked – the smell will be so lovely and they will all be golden brown, not burnt – take them out and brush immediately with the sugar syrup. I also like to add a sprinkle of any leftover roasted nuts. Now all there is to do is make a huge cup of coffee and tuck in, avoiding the huge amount of washing up for as long as possible.